Copyright : The State Library has endeavoured to identify and contact copyright holders of material digitised for this website. Where the copyright owner has not been able to be traced, or where the permission is still being sought, the Library has decided in good faith to proceed with digitisation and publication. The State Library invites persons who believe they are copyright owners to contact Library staff to discuss usage of this item. 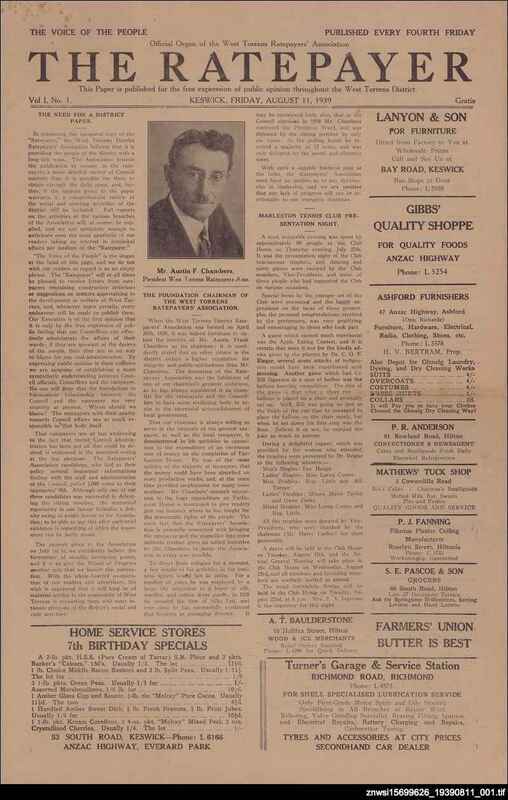 The Ratepayer was a one of many free community newspapers which appeared in the suburbs of Adelaide prior to the Second World War. The newspaper was produced by the West Torrens Ratepayers' Association, and a photograph of the Association president, Austin Chambers, was published on the front page of the first issue. The Association was large enough to have an executive committee as well as branches in each of the Council's three wards. The small newspaper largely consisted of critical commentary on the activities of the West Torrens Council. It also contained articles about local organisations such as the West Torrens branch of the Mothers and Babies' Health Association, and the Women's Wednesday Socialites Association. The Ratepayer appears to have had only one issue published.